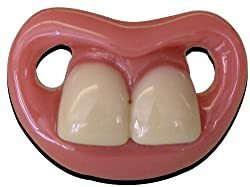 After hours of research, browsing through hundreds of user reviews, minutely scanning thousands of current best selling products, and conducting detailed comparison analysis, I bring to you a handpicked list of accessories for April Fools Day pranks, that'll garner you the maximum fun and laughs. The gift box appears to contain ridiculous products from clueless companies. Just pack your real gift inside, sit back and watch the expressions. 6 sides of real graphics and jokes will have everyone passing it around. These look like the real ticket, and have the same stiff cardboard like paper that real parking tickets are printed on. Go ahead, make someone's heart jump upon seeing it on a windshield. 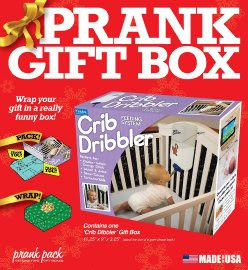 A safe and funny way to have babies take part in April Fools Day pranks. Makes a fun compliment to a baby shower gift. Great for fun and laughs any given day. These scratchers look like the real thing and when scratched they show a big win. But the big surprise happens when your victim tries to cash them in. Make sure they read the back so they don't decide to pick up a new car on the way home! "Would you hold this for a second?" Shake the bag, squeeze to "pop" the water pouch inside, and toss aside, the little bag will explode with a fairly loud pop. Sprinkle it in a strategic spot in the bathroom, the doormat where people wipe their wet shoes, the swimming pool area, the drinking fountain, etc. and this innocent-looking dark green powder creates a seemingly endless supply of dark purple stain when it comes in contact with water. This will stain almost anything, so use with extreme caution and discretion. This realistic looking roll of toilet paper is impossible to tear. Just replace a real roll with this no tear roll, and wait for the laughs to begin! Place this little metal tip on the exhaust pipe of someone's car, and witness the fun. The tip causes the car to whistle when the gas pedal is being pressed, and not when the car is idle. Have lots of fun and laughs this April Fools Day, and all year! Make full use of this list, and share with others who will. And for year round humor, keep visiting iSmiledYou - a blog created with the sole purpose of spreading smiles, sharing a laugh. A mission I take funnily, seriously, humorously, hilariously, sincerely.